Poly cloches are cheap, simple and effective to make. 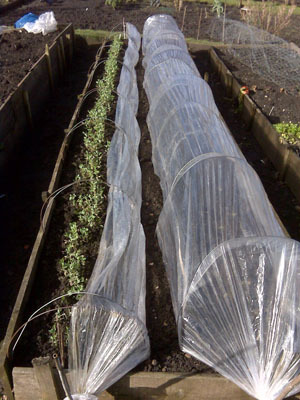 You need to find a horticultural supplier who sells “cloche film”. Cloche film comes in rolls of differing lengths, widths and thicknesses. I buy 200 metre lengths of 400 or 500 grade, 1.2 to 1.4 metres wide. You will also need a roll of thick gauge wire, (2.5mm diameter) and some strong wire cutters. Cut the wire into 1.6 metre lengths or slightly longer and shape into hoops. I have a stock of about one hundred hoops. Make them as you need them. When constructing a cloche, place hoops about a metre apart, with the end hoops 30cm from the border’s edge. Lay the cloche film over the hoops cutting off the roll allowing about 30cm of extra poly at each end for tying. Drive a long stick, a fat bamboo can is ideal, firmly into the ground at the ends of the rows, leaving about 45cm protruding, at a slight angle. Pull the poly tight and tie, gathered together, firmly to them. Then place another hoop over the poly close to the hoops already underneath and push them firmly into the ground pressing against the poly.